Outdoor living has never been more popular in the UK and this year's fabulous summer weather has made more of us crave a beautiful outdoor space in which to relax. There are many ways in which you can transform your garden into a beautiful and functional outdoor living area. Indeed, with careful planning your outdoor area can become a seamless extension of your home's living space. The first step is to decide upon the look you want. Some homeowners prefer the minimalist look whereas others prefer a more natural or rustic style. Whatever your style you will need to ensure that you start with a paved area which fits your design and which is durable and weather resistant. Here at Paving Stones Direct we have a huge range of styles from vitrified porcelain right through to slate and natural stone paving in various size options. All our garden paving is weather resistant and durable and as we import directly from producers we can pass savings direct to our customers. Our vitrified porcelain range can add that touch of luxury to any outdoor area. It comes in a variety of colours and finishes and is slip resistant. This type of paving would suit a more minimalist, modern style of garden. Paving Stones Direct also supply granite and textured paving, ideal for customers requiring a high quality finish in a more natural material. For those clients wanting a more rustic feel to their garden we have a huge range of slate and natural stone paving. Indeed, our limestone or sandstone paving comes in a wide range of natural colours and finishes. 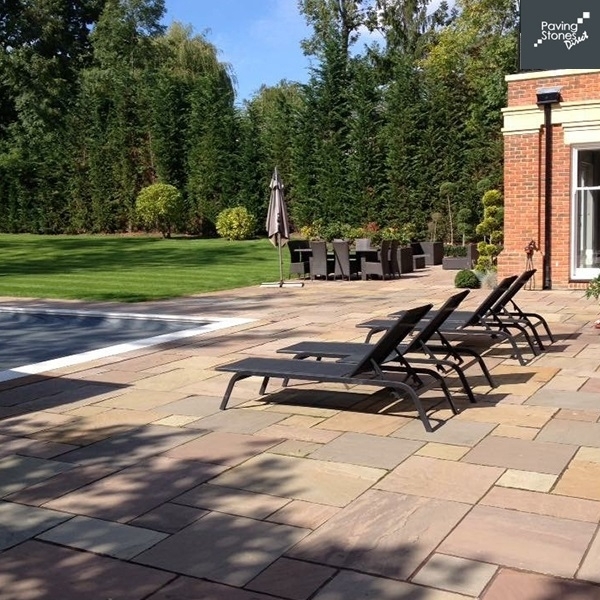 Once you have decided upon your ideal paving you can then begin to create your beautiful outdoor living space secure in the knowledge that your paving will stand the test of time. An outdoor kitchen or fire pit can give your garden a focal point, allowing you to entertain and socialise on those long summer evenings and, no matter what size of garden you have, there is a huge range of weatherproof garden furniture available to suit all styles and pockets. You might want to install outdoor lighting or even a fan for those extra hot days. You could add a pergola to provide extra shade on sunny days or a more weatherproof permanent shelter which would allow you to use your garden all year round. Once your outdoor area is finished strategically placed flowering shrubs or trees in tubs can complete the look. Check out our wide range of garden paving online now. With Paving Stones Direct your garden makeover doesn't need to cost the earth.